What I care about when I listen to a sound work is how much I enjoy it, with this I mean how the piece transformed things before, during and after my experience with it. Successful sound composition can lead to experience emotional points that when connected in time build profound meaning and widens the full picture of things. 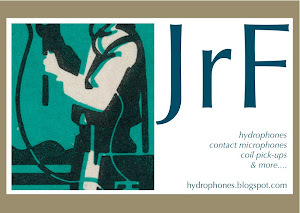 Sound art composition is one of the most open art forms I can think of, and this is probably because there is a potential abstract nature on every concrete sound we listen to -and even on some electronic and digital generated sounds- when isolated from its causality and temporal and spatial context. 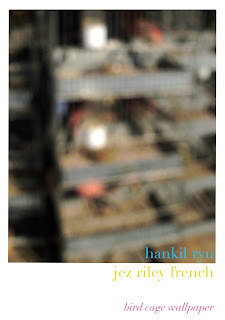 The sound art composition is like a wall where the listener projects the sounds he feels he is listening. The open character of the sound art piece in terms of image doesn’t make it necessarily more easily inhabitable but instead more freely inhabitable by the spectator / listener like something close to a sonic version of a Rorschach’s test. In this sense it’s about how much light you can find in the darkness and how much darkness you can find in the light. Like if what matters is not what we can sense or understand but what we can’t actually sense or understand but still be aware of. In regard of’ ’Bird cage wallpaper’ I could say that the relation between music and time is similar to the relation between sculpture and space -Music understood as the result of the reduced hearing-. When we walk while being fully aware of the formal aspects of the structures around us, we somehow build sculptural perceptions. When we listen reducibly, we listen music. 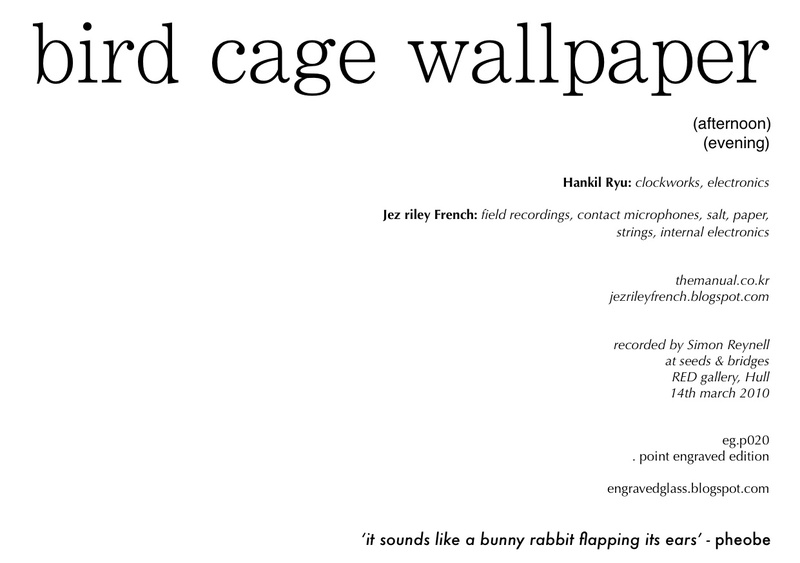 Rhythm as an aspect that was successfully taken care of on ‘Bird cage wallpaper’. Rhythm is often described as ‘movement marked by the regulated succession of strong and weak element’. I found this definition interesting because in rhythm we are dealing with magnitude and scales. The musical scale is often described as ‘any sequence of musical notes in an ascending or descending order’. All of these aspects (rhythm, movements, scales, magnitudes, ascension, descension) have been greatly and successfully dealt with on ‘Bird cage wallpaper’. 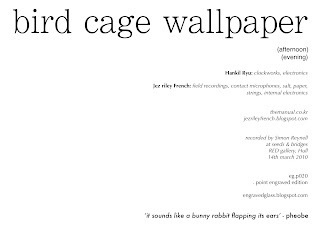 The emotional potence found in ‘Bird cage wallpaper’ is enormous, the actions, exercises and considerations that lead to the final two pieces were very fortunate: each sound presented on this work seems to have its own temporality and materiality, its own color, and these aspects and relations find on the rhythmical emphasis the best scenario in a quest for meaning. 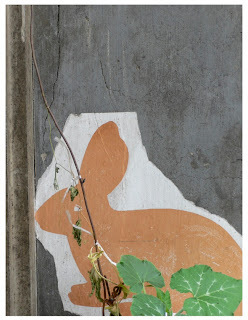 Rhythm considered as pulsating magnitudes of time, space, mass and color.